If you’re a fantasy lover, who also likes more than a little bit of humor in their lives, then this is one of those books you most assuredly do not want to miss. Missy is coming directly to Earth for more than just a shopping trip in downtown Manhattan. She is, in fact, on a quest. 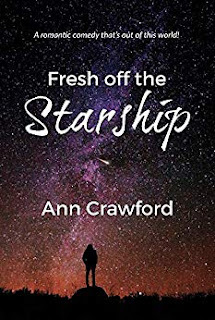 She has been given an assignment to stop Earth’s humans from heading into the dark abyss that is just waiting out there to destroy them and their planet. What she aims for is Washington, D.C. After all, that is the location on Earth where the people-in-charge sit. But, much like those aliens who ended up in Roswell, New Mexico back in the 1940’s, Missy ends up completely missing D.C. and instead lands in Kansas. As we all know, politics is not exactly what Kansas is all about. Once in Kansas, however, Missy provides enlightenment, humor, fun, and inspiration that only a “starbeing” could produce. As she awakens after landing on Earth, she hears strange voices all around her. Of course, they are human voices, but they sound more than a bit odd. Yes, Missy knows English. She had to learn it in her studies before heading out on this assignment. But the accent is brand new to her alien ears. Even though her mission has been diverted and Missy is now in Kansas attempting to live life as a small-town girl, she has not forgotten—nor has she given up on—her initial goal to help humanity discover the beauty and kindness that is all around them. Using her own charm, Missy leads people back to a world of understanding. A world that sees and loves nature and respects all creatures, whether great or small. This is one of those books that offers pure and utter honesty to readers. It allows everyone to laugh and enjoy the words and the character of Missy, while also being captivated by romance, a solid plot, and dialogue that is absolutely thought-provoking. We learn lessons through Missy, and each of us are reminded that life is something that should be cared for and never taken for granted. The author has done a great job encasing a true ‘chick-lit’ work within an emotional drama that, quite literally, can alter one’s perception. I give an A+ to this wise, memorable character. And, I must say, I hope this is one who readers clamp on to in order to perhaps see more of Andromeda’s “starbeings” come to Earth in the future. Frankly, I think one that does land in D.C. and gets a job inside The White House would be a joy to see. Quill says: An insightful, warm book that definitely does the author proud.